Yesterday Notre Dame beat Stanford on the road to finish the regular season 9-2. Right now the team is ranked #7 in the polls. That’s a pleasant change from last year’s unranked 6-6 team, especially considering that this year’s squad has mostly the same players as last year. For me, it’s not much of a leap to go from thinking about Notre Dame football to reminiscing about my time there. 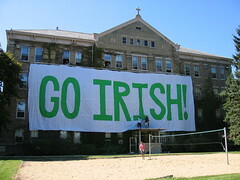 When I lived in Carroll Hall one of the things we associated with football was our 90 foot by 30 foot GO IRISH! banner. We made it from dozens of bedsheets, thosands of staples, and a fair bit of green paint. Before the season’s first home game, and others weather permitting, we hang the banner on the side of the building. It’s quite the operation; we need about 20 guys to hoist the ropes through the fourth floor windows. One time I took a short movie of us raising the banner which I later turned into a 5-second timelapse movie. I posted it here for your enjoyment and to celebrate our 9-2 season. You need QuickTime to view the clip. Go Irish in their upcoming BCS bowl game (we hope)!